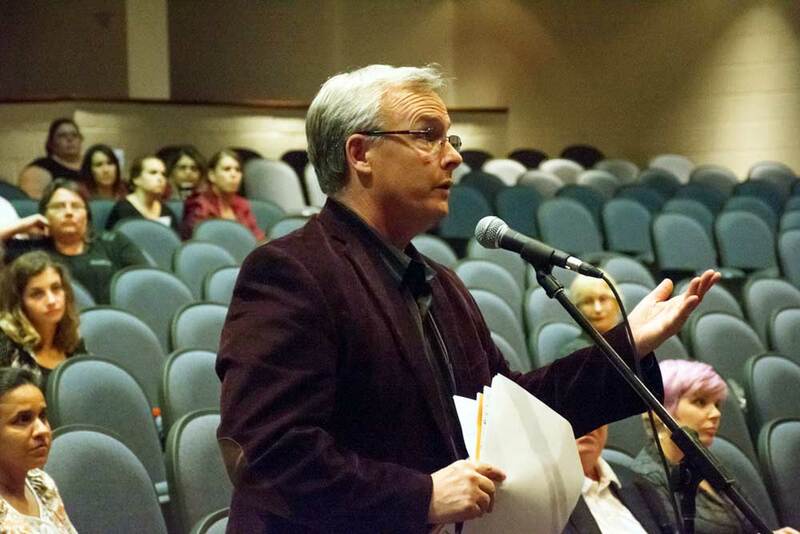 Parents and politicians alike, including Mayor John Henry and parent Becky Brand, came out to a meeting recently to advocate that Oshawa Central Collegiate Institute not be shut down this June. The Durham District School Board has said it’s considering closing the school’s doors, citing low attendance numbers. outcome of which could lead to the closure of Oshawa Central Collegiate Institute in June 2016. 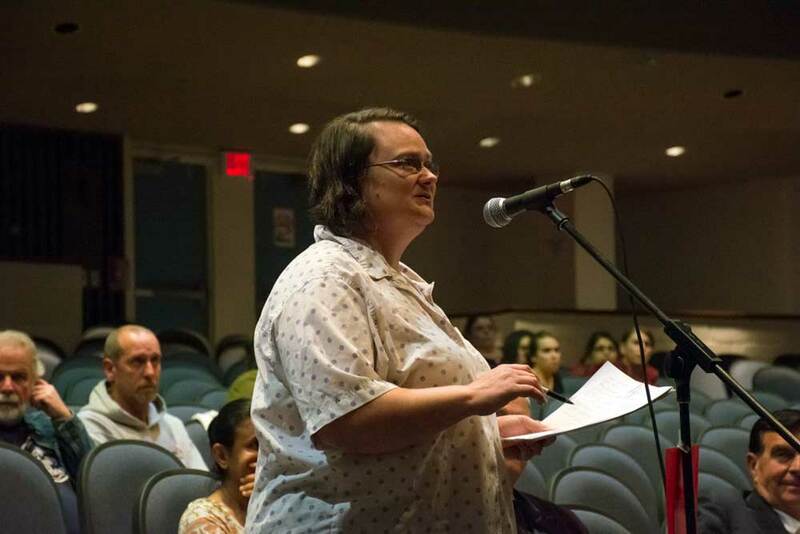 The latest public meeting, held late last month at Eastdale CVI, saw almost two dozen parents and teachers come out to thrash the five possible scenarios presented by the school board and the Accommodation Review Committee (ARC). The third in a series of four public meetings also saw the vast majority of Oshawa city council in attendance, advocating for the downtown’s lone high school. Councillors Rick Kerr, Nancy Diamond, Doug Sanders, Amy England, John Aker, John Neal and Mayor John Henry were all present to voice their opposition to the school’s closure. Two of the five scenarios, one of which is proposed by DDSB and the other by the ARC, involve the closure of Central CI. “We have to have the base numbers to be able to staff the schools…we do not have the base numbers,” said Luigia Ayotte, chair of the ARC and superintendent of education and program services. Central CI, built in 1968, has seen student populations decline since 2003, dropping from 944 students that year to 371 in 2013. Central CI hasn’t been close to its 834 student capacity in nearly a decade when student enrolment was at 824 in 2006. According to the ARC’s summary, Central is currently operating at 44 per cent utilization. In the proposals involving Central’s closure, students from the feeder schools would be consolidated into Eastdale CVI and RS McLaughlin CVI, or simply all students would be sent to Eastdale and an addition would be constructed at the school to accommodate the student influx. In the following three scenarios, in which Central remains open, portions of feeder schools that would generally see their graduating students setting off to Eastdale or RS McLaughlin, would instead be sent to Central to help improve the numbers. However, these options also saw criticism from members of the public as the disruptions to students’ lives and the need for further transportation both came into contention. Also, several members of the public were concerned for those students with special needs, who would be more heavily impacted by a school closure or switch than other students. “We have an opportunity to let these students flourish,” said Councillor Sanders, arguing many of these students will get lost in the process. At risk in Central’s closure is not only Oshawa’s only downtown high school, but also the special programs offered at Central, which include special education and trades programs. “We’ve worked hard to maintain our programs for the Durham District School Board,” said Scott Brinning, a teacher at Central. “The opportunities we provide at Central…allow students to take those pathways,” he said, speaking of the future options for high schoolers aside from college and university. Several parents also came forward, worried about students’ extra curricular activities. If Central were to close, many students would end up at Eastdale CVI, an already overpopuled school. As the last speaker of the night, Councillor England took the committee to task on several issues, including student transportation as well as the board’s projections for student enrolments, which stretch out to 2023. Current numbers show that student enrolments will remain fairy static at Central over the next eight years, and have a projected enrolment of 386 students in 2023, only 17 more than the current 371. It was argued that the projections didn’t take into account several new developments in the city, including a proposed 2,200-unit building on the old Fittings property. The fourth and final public meeting in the review process is slated for 7 p.m. on Oct. 22 at Central CI. The committee responsible for reviewing the facts and input from the public is comprised of 15 voting members, including school trustees and representatives from each of the schools involved which, along with Central CI, include Eastdale CVI and RS McLaughlin CVI. The Oshawa trustees involved in the process include Linda Stone, Larry Jacula and Michael Barrett. Of the three public meetings thus far, Stone is the sole trustee who has been present all three times to hear the public concerns. Jacula, while missing the Sept. 29 meeting, was in attendance for the previous two in March and June. Barrett was in attendance for June’s public meeting, but sent regrets for March and September’s meetings. Barrett did not respond when contacted by The Oshawa Express for comment on his absences from the meetings. Currently under discussion are five proposed scenarios: one from the school board itself, and four from ARC. While two proposals involve the closure of Central CI, three others involve the shifting of boundaries and the reallocation of feeder schools from other high schools to Central in order to boost the numbers. Below are short explanations for each of the proposed changes. The Board’s proposal would see the closure of Central CI and the students split and sent to different schools. Those students who live east of Oshawa Creek would be redirected to Eastdale and those living west of Oshawa Creek would then be attending RS. McLaughlin. This proposal also involves the construction of an addition to Eastdale to accommodate the growing number of students. This proposal received direct criticism from members of the public. “Why would you build an addition when you’ve a school right there?” asked Mayor Henry. Councillor Nancy Diamond also questioned the effectiveness of a plan that relies on funds from the province. The proposal involves a submission to the Ministry of Education for a 12-classroom addition on the right side of Eastdale. “I would just like a reality check in dealing with the province,” Diamond said, pointing out funds are not always easy to obtain, or obtained in a timely manner. The proposal would push Eastdale to 134 per cent utilization and RS McLaughlin to 116. This scenario, proposed by the ARC, also involves the closure of Central CI. It differs from the board’s proposal in that it would also include transitional transportation for students attending their new high schools. This proposed transportation would last for five years as well. For the first three years, additional staff would be allocated to accommodate the needs of those transitioning from Central CI. This proposal is the first in a series of options for student reallocation if Central is to remain open. In Scenario #9, Central CI remains open and a feeder portion of Clara Hughes Public School would be reallocated from Eastdale to Central. This would change the boundaries and see Central’s catchment area extend further east. The potential change could see Central CI increase its utilization to 58 per cent by 2023. However, the ARC’s evaluation questions whether this scenario could work and documents suggest that this change would not be enough students to positively affect programming at Central CI. The final two scenarios under the ARC’s consideration differ only slightly. These scenarios both involve four changes to current student catchment areas and boundaries. Both scenarios would see regular program students who live west of Stevenson Road and south of Adelaide Avenue, previously attending RS McLaughlin, reallocated to Central for the next school year, starting in September 2016. In Scenario #10, only a portion of the feeder students from Clara Hughes PS would be sent to Central CI, while in Scenario #11, all students from Clara Hughes would attend Central upon graduation. Public sentiment at the meeting suggested a balance between these two scenarios as a possible option, with only slight disruption in students’ educations. “I’d like to see something that created the least amount of future disruption,” said Councillor Kerr.